Exercise-based cardiac rehabilitation programs are effective in reducing cardiac deaths and have many positive health-related outcomes including improvements in fitness, symptoms, quality of life, sleep, and reduced feelings of depression and anxiety. [#oka-rk-de-marco-t-haskell-wl-et-al.-2000,#taylor-rs-sagar-va-davies-ej-et-al.-2014] Patients with known disease or those who have had cardiac surgery should be referred to a specifically designed exercise program. Is exercise safe for patients with heart failure? The safety of exercise for patients with more severe HF, women, the elderly and those recently discharged from hospital is less conclusive; therefore, exercise for these groups should be prescribed more conservatively. Those with more severe symptoms are most likely to demonstrate greater mortality and morbidity benefit from supervised exercise training compared to those with fewer symptoms. [#piepoli-mf-davos-c-francis-dp-et-al.-2004] Similarly, those with frailty also benefit from exercise training and should not be excluded from exercise training programs. Training the periphery is a specific objective of exercise in cardiac patients because the locus of limitation commonly lies in the skeletal muscles. The total amount (dose) of exercise is a function of its intensity, duration and frequency. This total quantity is the main determinant of outcomes. Exercise prescription must consider these variables in combination as they influence both potential training adaptation and the level of fatigue to be expected. The Fick equation (see below) is used by scientists to identify the various components of oxygen consumption and therefore energy expenditure during physical exertion. The Fick equation can help identify the limitations of physical exertion. The hallmark of heart failure (HF) is exercise intolerance due to shortness of breath and fatigue. 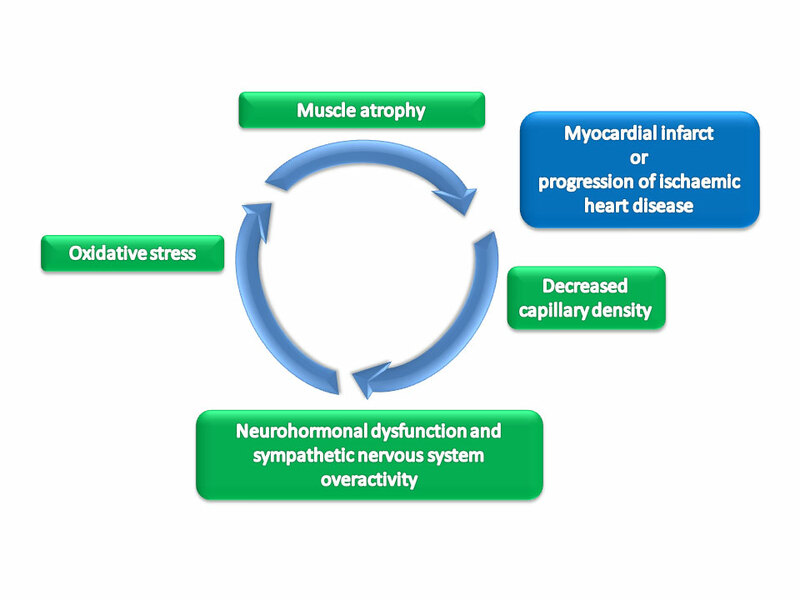 In people with HF, skeletal muscle function is often impaired and may contribute to symptoms that are experienced. When prescribing exercise for patients with cardiac disease, it is important to consider the underlying physiology of the cardiac condition. For more detailed information, see exercise for specific clinical conditions. Individuals with ischaemic heart disease, but not HF, can be prescribed longer continuous exercise tasks unless they are limited by angina symptoms. Furthermore, the use of resistance training may be less detrimental to cardiac function in these patients. The presence of co-morbid diseases such as diabetes or chronic obstructive pulmonary disease (COPD), however, may require the exercise intensity and volume to be adjusted according to symptoms and not age expectations. Exercise intolerance is a hallmark feature of HF with the primary limitation being impaired cardiac output (CO). A CO of approximately 5 litres per minute is needed to sustain organ function and prevent symptoms of exertion. Healthy people can raise their CO to 15-20 litres per minute during physical stress, however patients with HF, may not be able to increase their CO to the same extent during exertion. For patients with HF, there is often insufficient blood delivery to working muscles during exercise which is often compounded by a smaller skeletal muscle mass served by a deficient capillary bed. The net result is that the ability of someone with HF to extract oxygen from the blood is impaired. With consideration to the Fick equation, this means that CO is impaired in patients with HF, while the arterial-venous oxygen difference is also abnormally low. The exercise guidelines for HFREF and HFPEF are effectively the same, with both groups benefiting to a similar degree from aerobic exercise. For older and frailer patients, as is commonly the case for those with HFPEF, resistance training may play a more significant role. In these patients, resistance training aims to improve the active muscle mass available during physical exertion without the risk of compromising systolic function. Functional class is also relevant when prescribing exercise. Most patients with heart failure symptoms classified as NYHA functional class II and III are able to attend and complete group exercise rehabilitation programs if accessible. However, some patients with class III and IV symptoms may benefit from supported home-based exercise approaches whereby exercises can be tailored to a lower intensity level and progressed more slowly to accommodate the individual’s level of fatigue and function. Taylor RS, Sagar VA, Davies EJ, et al. Exercise-based rehabilitation for heart failure. Cochrane Database of Systematic Reviews 2014, Issue 4. Art. No. : CD003331. DOI: 10.1002/14651858.CD003331.pub4. Maseri A. Inflammation, atherosclerosis, and ischemic events - exploring the hidden side of the moon. N Engl J Med 1997;336:1014-1016. Thow M (Ed.). Exercise Leadership in Cardiac Rehabilitation - An evidence-based approach. UK: John Wiley & Sons Ltd. 2006. Myers J, Gullestad L, Vagelos R, et al. Clinical, hemodynamic, and cardiopulmonary exercise test determinants of survival in patients referred for evaluation of heart failure. Ann Intern Med 1998;129:286-293. Agusti AG, Sauleda J, Miralles C, et al. Skeletal muscle apoptosis and weight loss in chronic obstructive pulmonary disease. Am J Respir Crit Care Med 2002;166:485-489.